Become trusted and raise your traffic as well as your sales. Publish your reviews on your business profile and decide which information customers can see there. The newest reviews will be displayed on your profile automatically. You can show or hide every network individually on your profile if you want. After your registration, you get your profile instantly, where you are able to set your logo, your company description, social media channels and many more. Your customers will find all relevant information structured and at a glance on your business profile. You can find more details about the Trustami business profile here. What makes your Trustami business profile special? You can show all networks with their reviews on your profile. Show every review or customer experience you earned somewhere online at one place. Your business profile contains your company description and all important information. Furthermore, visitors can discover your customer experiences in form of their reviews and comments. Your customers want to give you feedback? Offer them an easy way to do so. They can review you via known platforms like Yelp, Facebook or Trustpilot. As long as you are registered on one of these platforms you can show a rating link on your profile and use i.e Dacebook to collect new reviews for free. The history of your reviews and other facts are displayed graphically on your profile. There is a graph that shows the history of your reviews per network. You will also find numbers about your visitors and your all followers. The reviews and comments are sorted by date. 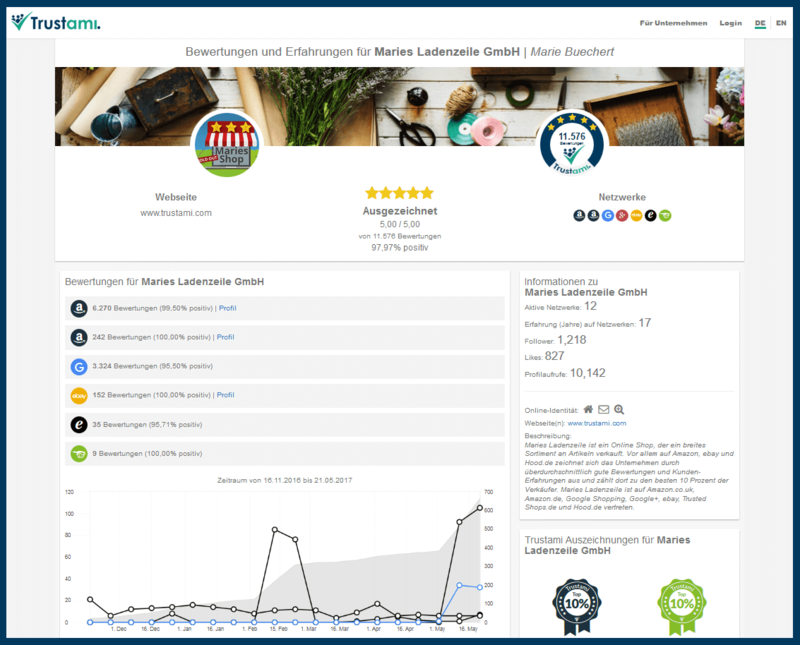 Additionally, it is possible to filter all reviews based on their rating (positive, negative, neutral) and get a good feeling what customers say about you. If you are one of the best rated companies on one platform we give you an award for this network. You can get an award per platform and each one can presented on your business profile. You can choose between several images in order to customize your business profile. If you want your own image on your profile you can send it to us. Our support will then optimize the image to fulfill our requirements and upload it to your profile. The Trustami business profile was developed for mobile devices in order to address the trend of Google's 'mobile first' initiative. We also prioritized very low loading times. This is really important for a good page rank. Customers should find you because of your outstanding reputation!